east side bride: my first giveaway! I haven't done this before because honestly I would never give something away that I didn't want myself. But when Christina Richards emailed to tell me how much she likes the blog (Ihavethecoolestreaders) and I discovered that she just opened an etsy shop, I begged her to let me do a giveaway. So go visit crPhotography. Then come back and tell us which photo is your favorite. Or if you're really really lazy and you happen to love Bubbles (pictured) feel free to leave a comment right now. The winner (to be chosen at random a week from today) will receive the fine art print of her choice. Ocean Path, Ocean Path! gorgeous photos. Apple picking. Or pink balloon. I can't decide. apple picking is my favorite. although bubbles is very eye catching! I love the easter eggs! oh man, ocean path is beautiful. they're all beautiful! love this. Ocean path is my favorite. It makes me think of D's photos from Ireland. Apple Picking... definitely. I grew up on an apple orchard. The photo is just like home. yay on your first! I loooove Moon over Margaree. it's dark and yet so magical!!! Love it. bubbles is my favorite! i mean, BUBBLES! 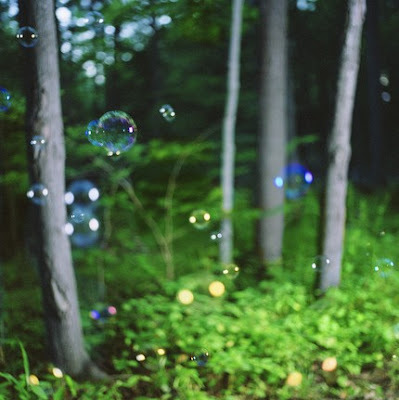 magical floaty foresty bubbles. they win! and hopefully i do, too. yay! I went to the etsy store - but I love Bubbles the best! Apple Picking is so lovely and mysterious and I want it. Please and thanks! LOST Sometimes we all feel like a lost glove. Somehow, it evokes hope in my mind. Lots of pretty photos, but for something to hang on the wall that is both me-friendly and boy-friendly, I would definitely go with Paper Airplane. I like Swing, and I resent that you use the pronoun 'her' as you have male readers. Surely that error is worth a print. The swing is my favorite. Reminds me of being a kid, which I think we could all stand to relive from time to time. In fact I am lazy and I do like the bubbles. But, I also really like the riddled tree photo. It seems so sad and beautiful at the same time. Why hello Kyle. I finally caught you! (frantically waving arms in the air) Bubbles! Bubble, bubbles, bubbles, bubbles. Bubbles! Wow, it's hard to pick just one. But I think the painted easter eggs are my favorite. Oh my gosh! Riddled Tree is my favorite but it was hard to pick. Her photos are great! It's hard to choose just one...I'm torn between the safety pin one and the easter egg one. Congrats on your first giveaway, and thanks for the opportunity to win such a cool item! A tree in brooklyn fo sho. oh the swing! the swing just gave me the chills. and thank you for the comment, you were my first ever. and i thought only my mom looked at my blog when she missed me. Ooh I'd love me a pink balloon. My fiance and I both love "The Woods." Great giveaway! Thanks for the giveaway! My favourite is "Lost" (the one with the mitten). Beautiful focus and colours. I love "Painted Easter Eggs"! oooo! all so beautiful and mysterious. swing is my favorite... totally evocative of a warm summer evening. great giveaway! I love Easter Morning. It's so awesome! Bubbles! Although painted easter eggs and easter morning were close contenders. They are all beautiful photos. I love the "bubbles" and "swing". Love, love, love it! I love "A Tree In Brooklyn", "Ocean Path", and "Apple Picking"! all are so lovely, but riddled tree is my personal favorite! Bubbles. Simple yet delicate...a nice way to brighten up a poor students day...and give her some much needed zest! Beautiful photos! Apple Picking is definitely my favorite. i love Fence. it's both urban and ethereal, and i can't help feeling, "go girl! you can make it!" I love "Lost" and "Moon over Margaree". Great giveaway, and great photos - thanks! I like Apple Picking better. I like giveaways, and you... and I know you like me so lets make a deal: just pick me. I actually do like bubbles the best! Not trying to be lazy...but "bubbles"...it reminds me of my dad who loved to play with bubbles when my brother and I were kids! The swing! I love the swing! Paper Airplane is my fave. All the shots are really sweet though. Hard to choose between Lost and Swing. Very nice! The Pink Balloon is my absolute favourite! Cute blog btw! Bubbles! so so pretty and gorgeous colours. The etsy site says they are more vibrant in real life...I have to see it! Ocean path is the one! I love the Ocean Path and Magnolia pictures, so pretty! The bubbles are pretty adorable too. Ooooo....I really feel that the swing picture would fit in well with some prints I already have hanging in my room. And hey, who doesn't like to go to the park and swing? a lot of pretty indeed: pink balloon without a doubt! I've debated back and forth over which print is my favorite for the past 15 minutes... it's was between apple picking and pink balloon. The final vote: my boyfriend's standard poodle seemed to gravitate towards apple picking. I love the darker, almost surreal prints, but ocean path just takes me to the place where i'm very very small and safe, headed to the familiar beach of our annual family vacation. I think I like Tree in Brooklyn the best. a tree in brooklyn. love the lighting. Pink balloon. I imagine feeling a little bit of joy every time I look at it. I can't decide between 'Moon over Margaree' and 'Lost'. They are both stunning and winning either would be fab! I like painted easter eggs best, so calm and lovely.